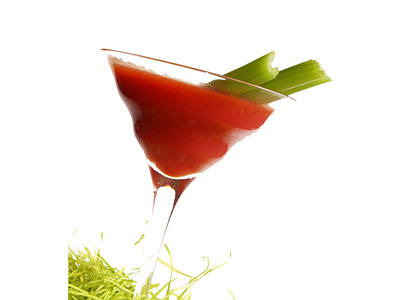 This is a recipe wherein bloody mary is prepared and served in typical martini style. The Worcestershire sauce, Tabasco pepper sauce, ground black pepper and celery salt bring in spiciness with subtle flavors that compliments the taste of tomato juice and vodka. This is a cocktail that you can drink before noon in a brunch and no one will raise their eyebrows. Follow this easy bloody mary martini recipe to make best brunch cocktail in few easy steps at home. Add ground pepper, salt, Tabasco and Worcestershire sauce in a cocktail shaker. Fill up cocktail shaker with crushed ice until 2/3ed capacity. Add vodka and thick tomato juice over it and shake well. Fine strain and pour mixed drink into chilled martini glass. Increase or decrease the quantity of sauces and salts used in this recipe to make it more or less spicy respectively. There is one more classic way to garnish this drink. Before pouring bloody mary mix from cocktail shaker into glass, frost glass’ rim with mix of celery salt and ground black pepper. Taste: Spicy and refreshing tomato flavor with touch of hot and spicy sauces. 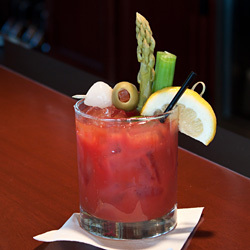 Serving Ideas: It is widely preferred as a light drink for relaxed brunch. However, you can drink it the way when it was invented; in parties and get-together.